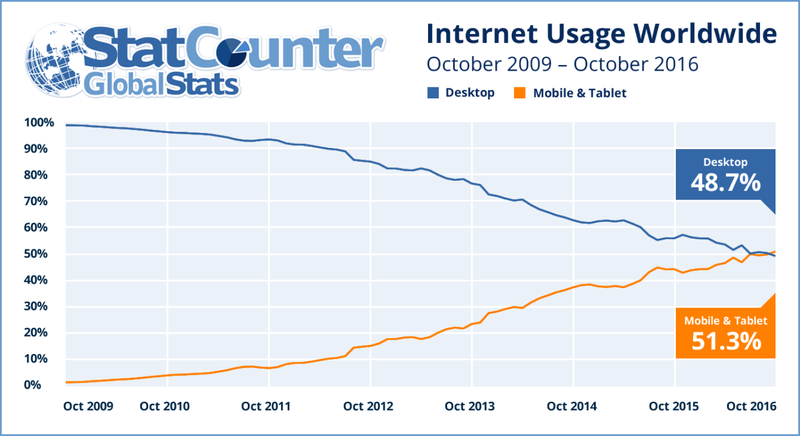 For the first time more users are accessing the internet from mobile devices than from desktop computers. That is according to internet monitoring firm StatCounter. The combined traffic from mobile and tablet devices tipped the balance at 51.2 % versus 48.7% for desktop access. In emerging markets such as India, mobile is by far the preferred way to access the internet with a staggering 75% of users using mobile only. Mature markets such as UK, US and Ireland are still in favour of desktop, but the gap is narrowing. Zenith Media have aslo just published their paper Mobile Advertising Forecasts which states that mobile will account for 75% of worldwide Internet use in 2017. The study is based on advertising and mobile tech data across 60 countries. Overall, the proportion of mobile Internet usage has grown from 40% in 2012 to 68% this year. By 2018, it’s set to reach 79%. The countries with the highest levels of mobile Internet consumption are Spain, Hong Kong and China. Zenith states that mobile in Spain will account for 85% of Internet use this year, followed by Hong Kong at 79% and China at 76%. The US ranks fourth (74%) with Italy and India tying for fifth spot at 73%. Whilst smartphone penetration is driving the majority of mobile Internet usage, having reached 56% this year, tablets are still more of a luxury item and are expected to generate 18% of penetration by 2018. Interestingly, the data suggests that Ireland may have the highest smartphone penetration at 92%, followed by Singapore (91%) and Spain (88%). With the rapid uptake of mobile devices across the world, mobile advertising spend is set to jump ahead of desktop by 2017 at a global Internet ad share of 52%. That’s an increase of 8% from 2015. By 2018, mobile ads are likely to account for 60% of total Internet advertising with ad expenditure of $134bn – more than newspaper, magazine, cinema and outdoor advertising together. The research strongly signals that it’s time for marketers to focus on mobile-first strategies and cater their campaigns for mobile screens and formats. In addition, advertisers need to re-discover their audiences to find out how mobile devices are being used across the day. Cross-screen advertising is already a big thing. In addition, it’s good practice to include all mobile devices such as smartwatches and other activity trackers when planning a campaign.